Style, which synthesises the essence of a trademark in a hull, may be defined as the overall grouping of aesthetic, design and innovation messages set in harmony by the designers' talent and skilfully implemented by the yard's know-how. This great blue and silver blade, which cuts through the waves at 40 knots with the "merciless" grace of a razor, declares its origins immediately: Italy, Liguria, in a word Baglietto. For the historic yard, which incidentally celebrates its 150th anniversary this year, Francesco Paszkowski has designed a splendid sea coupe in which his personal stylistic interpretation is coupled with the modern technological function of the machine. 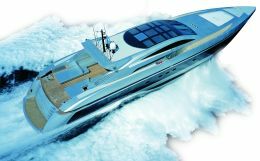 The design also has the merit of being a natural evolution of the many superyachts which this Tuscan designer has created for the Varazze yard. The quick-works also display evolved forms specially designed, by the engineer Alcide Sculati, to offer maximum efficiency precisely with the jet configuration adopted which uses KaMeWa pumps coupled with powerful MTU engines of an overall 5.550 HP. Certification: Maltese Cross 100-A.1.1 "Y"
A Mediterranean open like this - let's define it as such though it is equipped with a hard top - is considerably evolved in comparison with its predecessors of twenty or thirty years ago when it was still permissible for a status symbol to be uncomfortable. Now the opens are actual yachts and the owner's requirements of speed, elegance, functionality and absence of noise and vibrations are combined, by architects and engineers, with other absolute plusses such as lightness of materials and the search for new advanced construction technologies, while never losing sight of the qualitative level. "Astarte", a modern myth with the name of an ancient one, is aesthetically uncompromising: the lines flow uninterruptedly from bow to stern. Obviously there is an anchoring system - indeed there are two - but everything is suitably concealed, like the tender, invisible in a garage below decks. The main deck is only formally divided into interior and exterior: in fact the four glass doors between saloon and cockpit can be closed to separate what is actually a single large living space which proceeds from the dining and conversation area to the sundeck outside. A sensation of continuity indubitably embellished by a top which is actually a bright cupola in filtering glass panels that can be opened, giving an undeniable airiness to the interior, while the air conditioning system - defined as "tropical" - maintains temperatures even under the most burning sun. On this type of vessel every layout is customised: the only things that cannot be touched are the structural bulwarks of the engine room and the watertight compartment in the bow. So operating on the remaining volumes Francesco Paszkowski and the owner's architect, M.me Chopard, created spaces and furnishings in which a fairly traditional setting is coupled with modern and simple lines and quite cool, neutral tones. 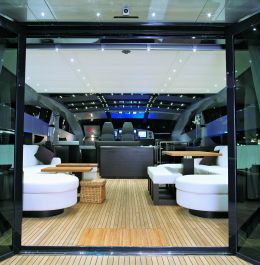 The same sober teak of the cockpit is used for the sole of the saloon, contrasting with the dark shades of wenge and the bright fabrics of the sofas. 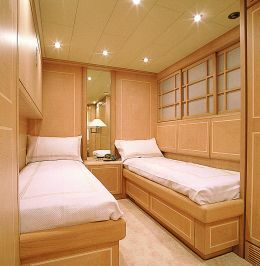 The light areas of the furnishings below deck are decorated in pickled oak, with subtle fretwork and with a thin maple fillet around the perimeters. 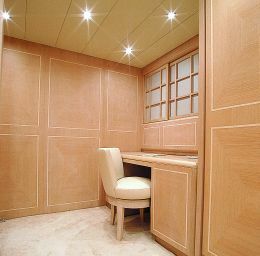 In the night zone on the lower deck the owner's suite is located forward, with office and wardrobe in the antechamber. 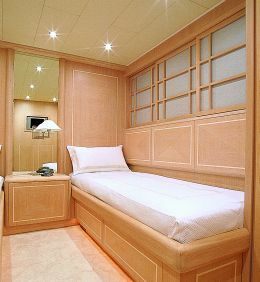 The cabin runs the entire width of the ship and includes a large bathroom. The other two cabins, guest and VIP, are done in the same materials and nuances of colour. Both have twin beds, ceilings in cream leather, wash-hand basins in Lens stone, light coloured fitted carpeting and "ethno" panels screening the ports. 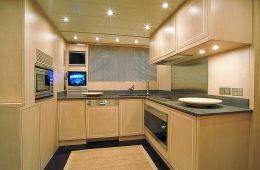 In a barycentric position with regard to the cabins is the galley with dinette for the crew or for informal meals. It is fully equipped with dishwasher, washing machine and dryer, a ceramic hotplate, two ovens and made to measure fridges, plus everything else that may be needed on a cruise. 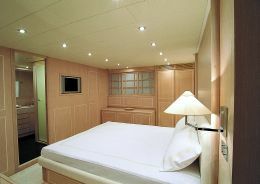 In order to rationalise the spaces and ensure maximum privacy the design has envisaged access from here to the captain's and crew's cabins and to the engine room. Needless to say that the latter is an outstanding example of functionality where two 2775 HP MTU engines reign, capable of expressing their power 24 hours a day. The bridge, amidships, has a somewhat spatial aspect. The Baglietto family of the 20's would certainly have been proud of it, champions as they were of any innovation borrowed from aeronautics that might serve to make their boats lighter and faster! In fact the bridge equipment is in accordance with GMDSS standards for pleasure craft, absolutely complete: radar, various GPS interfaced with touch-screen video systems, control video-cameras, VHF, SSB, autopilot, compass and all the instruments and controls for waterjet engines. The course may be changed using either the helm or the hand-levers, but also by means of a small joystick which, in our opinion, is highly useful especially during manoeuvres since the vessel responds to the slightest impulse, practically moving in any direction with an almost disarming simplicity. Under way this enormous motorboat sails and changes course in maximum comfort at all working speeds from the planing minimum (19 - 20 knots) to the maximum of 40 knots, disproving the conviction that jets must sail well only at high speeds. The yard, taken over a few months ago by the Camuzzi group, now has another important challenge to face: an even larger open - a 115 footer - again in aluminium but with surface screw transmission.